During the winter months, storms can bring power outages, especially in the northern part of the US. Think about what you would need if the power went out for more than an hour or two. This not only can help you feel more comfortable but can save you money by keeping you out of the stores when people are panic buying their supplies. Have some candles and/or oil lamps handy so you can light each room. Candles in glass containers are safest with little ones around. 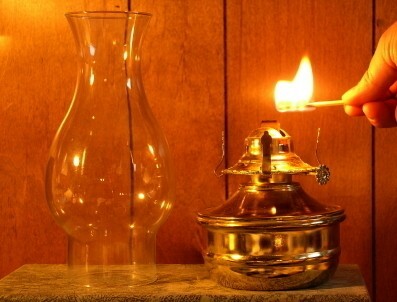 Make sure if you have oil lamps that you have a bottle or two of lamp oil with your supplies. Flashlights and camping lanterns are also great. Make sure you have extra batteries. Your refrigerator will not work. Try not to open it to keep the food cool. Put two soda bottles filled with water or refreezable ice packs in the freezer space. You can then redistribute them, one for the freezer space, one for the refrigerator. It will help keep the food cool for longer. If you have a large freezer, keep extra soda bottles filled with water in it. When the power goes off it will keep frozen for longer. If you have an electric stove or microwave, they will not work. Gas stoves may continue to work but you may have to light them by hand. Have matches ready and procedures for lighting your stove. Also have food available that you don't need to cook. Many furnaces whether gas, oil, or electric have an electric starter and electric fan that blows the heat. None of these work in a power outage. Extra blankets are helpful. If you have a fireplace or wood stove, make sure you have a supply of wood or fire logs to last a few days. Think ahead. Each household has different challenges when the power goes off. It is always good to have backup systems available. Try to plan for it so if it happens you will be ready. When the power was off for 3 days, we taught our grandkids games they could play outdoors like jump rope, hopscotch and jacks. It seems that most kids have never heard of the old games we use to play. Our granddaughters loved all of the games and had a blast. 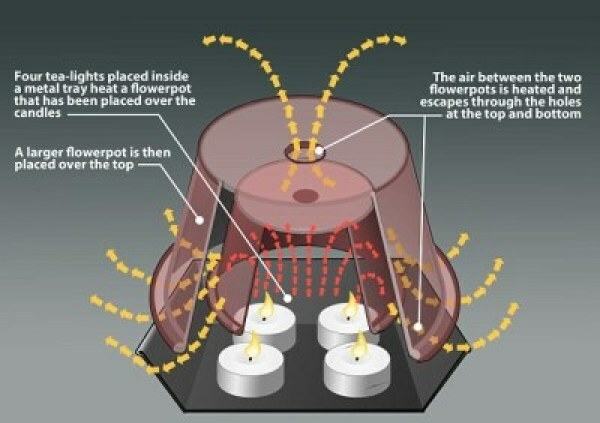 One thing that I added to my emergency kit here at home is a "flower pot heater". It won't really heat a large room, I'm sure. Thankfully haven't had to use it for that yet! But I have tried it and it definitely gives off a lot of heat, enough to warm a small area and to heat up a cup of tea or can of soup. I don't have a gas stove or fireplace so any source of heat is a plus. Here is a picture but google it and you will find lots of information. Hmmmm, the picture isn't working but as I say, google it and you will see lots of them. Oh, good. Now I see the picture. It will give you an idea of what I am talking about, but google it, you will find lots of information.